My brother is my best friend. 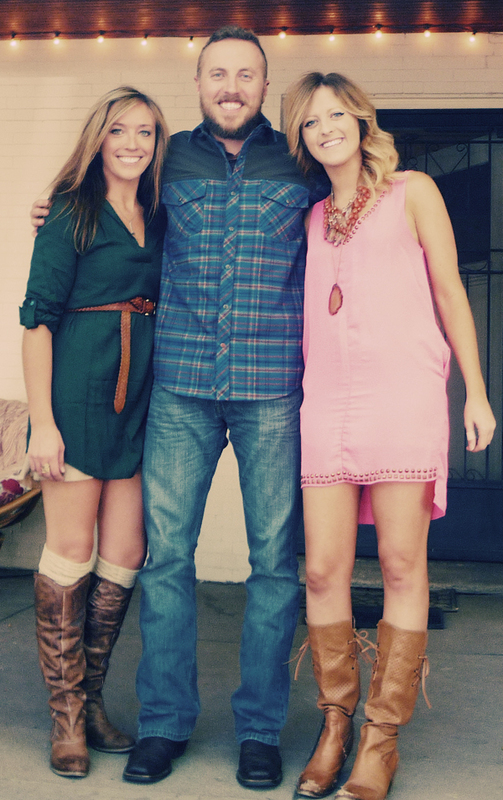 And, I love him to death. So, since his 30th birthday was quickly approaching, I knew I had to do something to honor him and show him how much he means to me and all of our friends and family. He said he didn't want anything crazy. Well, A: I don't know what "not" crazy is, and B: I'm his sister so I don't have to listen to him all the time. 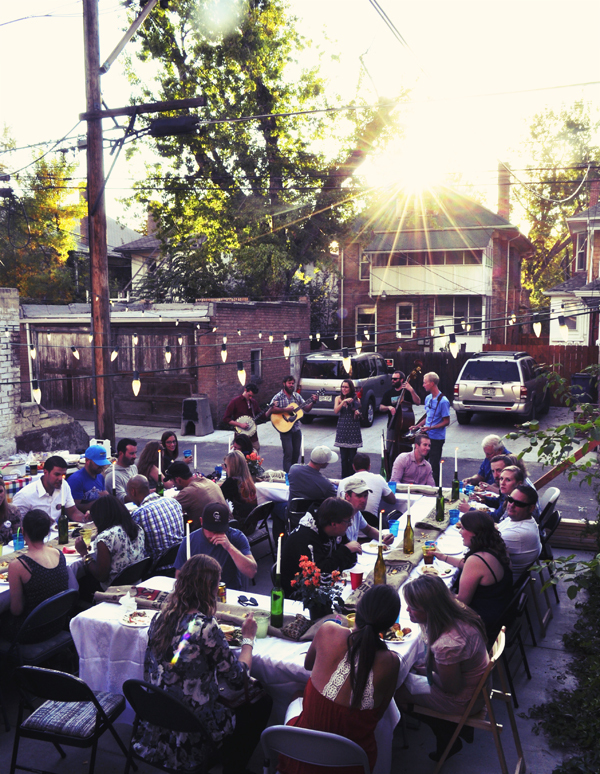 Thus, I decided to throw a Harvest Moon BBQ with good friends, good food, good music and a few surprises! 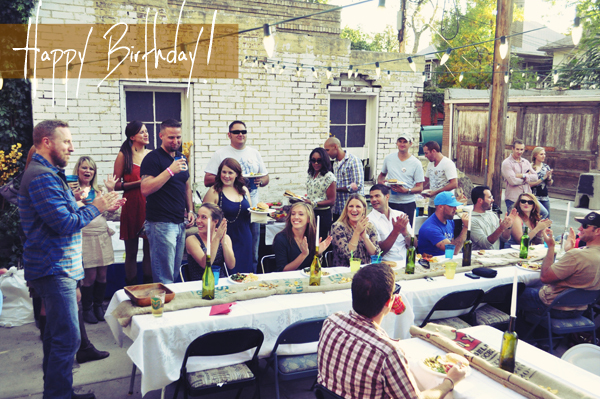 As usual, this party was done on a budget and with lots of creativity. I had some amazing people team up with me to make this happen! Everyone came together to pull off a wonderful party - Big shout out to Terese, Koye, Rachel, Randi and my parents for all their help and resources! For the theme, I was inspired by the long farm table rustic dinner party. We have a small backyard, so I decided to utilize the alley parking lot instead for the space. It's bordered by a rustic brick structure and lots of greenery. It was a beautiful foundation for the theme! My good friend Koye is a wizard. Seriously, any idea I throw at him, he just miraculously does it with ease. He installed a wired system for hanging lights over the space. Needless to say, it was perfect and really set the ambiance for the party. 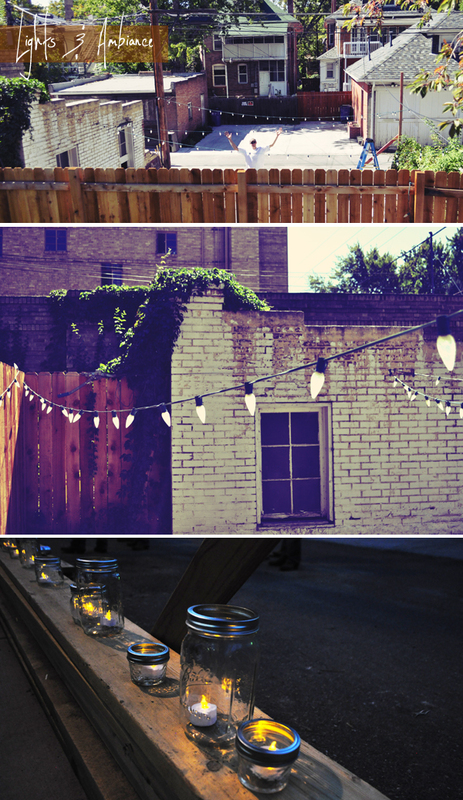 We also added mason jar lights throughout the space that also acted as a barrier between the party and the alley street. To execute the farm table dinner look, we needed a long table to fit everyone as well as white table cloths. Luckily, my good friend Terese came to the rescue and provided these things! 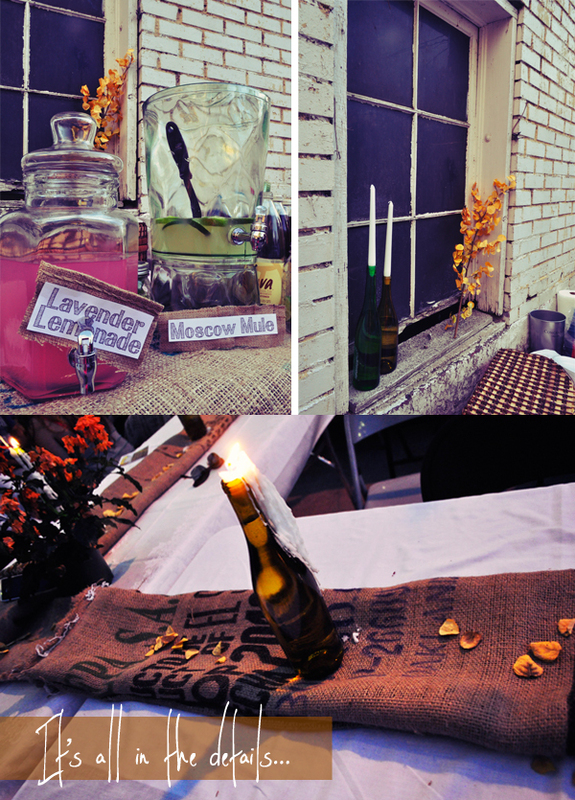 For the centerpieces, I wanted to utilize burlap table runners and empty wine bottles as candle holders for an extra rustic ambiance. Thanks to Novo Coffee in Denver, I picked up several burlap sacks that came from family coffee farms all over Africa and South America. My team and I cut them into table runners for the party. Thanks to my friend Rachel, I didn't have to consume 25 bottles of wine before the party and she brought some from a bartender at a wine bar she knew! We filled them with water for extra stability and added candles that melted beautifully throughout the evening. My mom also handpicked fallen aspen branches from the mountains to add an extra bit of rustic warmth. For food and drink, we served Blueberried BBQ Pulled Pork (as mentioned from this party), homemade Moscow Mules, my signature Lavender Lemonade, Ryan's favorite (and famous) Strawberry Cake from NoNo's Cafe, some speciality sides and everyone brought additional sides and drinks to share! One of my brother's favorite poems is "Shake the Dust" by Anis Mogjani. He literally manages to show everyone this poem within 10min of meeting them. It's incredibly inspirational and focuses on living and loving your best. Take a look here. I wanted to make it a central message. Thanks to Pinterest, my incredible team and I used this project to convey it rustically and beautifully. Plus, he got to keep the sign as a gift! I couldn't let the night slip away without a few surprises. Ryan and I's favorite local bluegrass band is Trout Steak Revival. They are so laid back and talented and really get the party goin. I just had to call them to make a surprise appearance at the party. They came up the alley singing Happy Birthday and really blew us all away with their entire set. Even the neighbors were opening their doors and windows because they enjoyed the music so much! Since we were headed to Ryan Bingham at the Ogden Theatre for our last event of the evening, I couldn't just let us walk. We had to arrive in style! 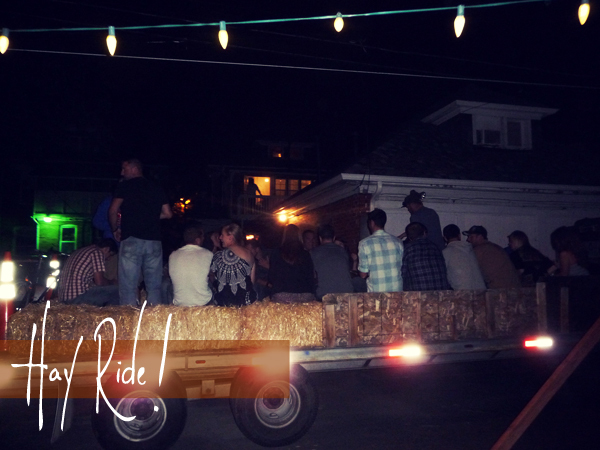 So naturally, I hired a hay ride to take us around the city and drop us off at the venue. It was the perfect end to a perfect evening! This was so fun to plan and put together. I couldn't have done it without the help of our friends and family! Until next time!